Imagine a situation, 4000 thousand years from now something happens to this world we know and everything is gone. The language we speak, the cities we have and technologies we are proud of. It just happens that someone finds one of our cities and starts finding so many different kind of stuffs like the plastics with some writings, sewers and drains, foundations of building but unfortunately nobody is able to make sense of any of those because language cannot be deciphered and there are all sorts of possibilities being explored by the citizens or the inhabitants of our earth of that time. This is exactly the same case with Indus Valley Civilization. Somewhere around 1920 in the colonial British Raj the mounds of Mohenjo Daro and Harappa were found and from then onwards more than 1000 sites related to this civilization have been found. 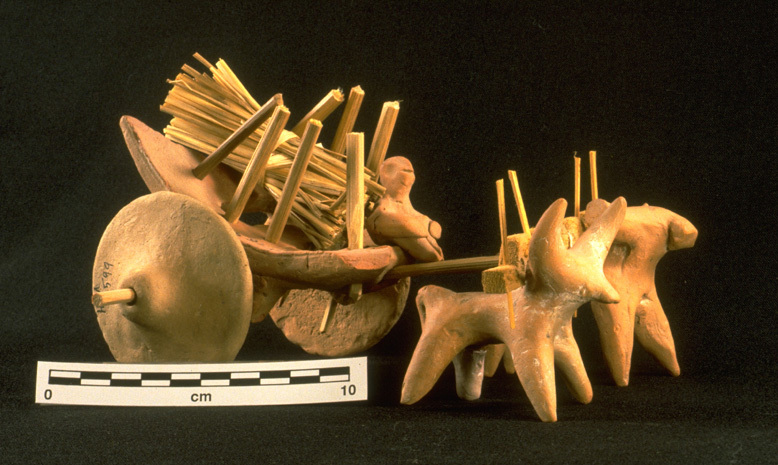 The archaeologists who found Indus valley civilization initially thought that they have found a civilization of children as a huge number toys (like the image shown above) were excavated which signifies that these people were leading a peaceful happy life. I have been spending a lot of time for few weekends reading up and watching videos on Indus Valley Civilization for which I have suffered ire of my wife. Here are few important questions that I still not able to figure out but I will try to put them down so that my research can be streamlined. Is Ghaggar-Hakra the Saraswati River mentioned in Rig Veda? There has been so many camps and the beliefs and ideologies of the member depends on which camp you belong. I am trying to gather here what I could figure out with my mini research. As shown in the map above over 1000 sites that have been located we can divide them into two, one located on the Indus river basin which is still flowing and one on extinct river basin which has been called by different names Ghaggar, Hakra or Sarasvati. Ghaggar-Hakra still flows but its no longer perennial Himalayan river but one that dries up in summer. Sarasvati is a river that find maximum number of mention in Rig Veda which is by the way earliest Veda. Here are some inferences that have been made about Indus Valley Civilization and Rig Veda. Indus Valley Civilization’s downfall is attributed to the natural causes as against Aryan invasion as it was believed earlier and probably drying of the river bed may account for much of that. Now the mature Indus Valley civilization has been agreed to be 2600 to 1700 BCE and around this period metropolis of Harappa and Mohenjo Daro had collapsed. The sites found in today’s Gujarat like Dholavira survived a little more till around 1300 BCE. Rig Veda is believed to written somewhere around 1700–1100 BCE which overlaps with end of matured Indus Valley Civilization and late Harappan period. Did the people who wrote Rig Veda belonged to extended family of the the Indus Valley people who traveled towards the Gangetic Plains when the environment became more hostile. According to scholars the people who wrote Rig Veda were Agro-Pastoralists which means that cattle and other domesticated animals were given more importance than the crops. And many times they tend to moving around due to presence of large cattle bases which depreciates the environment in few years and necessitates migration to newer pastures. On the other hand Indus Valley Civilization is seen to have metropolis, large scale water irrigation systems and full fledged economy based on trade which creates a confusion as to how Rig Vedic people and Indus valley people can be the same. It become such a mess and getting any concrete conclusion becomes all the more difficult. The present day politics and spread of sites into two different countries of India and Pakistan makes it all the more difficult to find answers to such questions. Even if we get the answer about Ghaggar-Hakra and Sarasvati, there still remains questions about who Indus valley people were and who were the Rig Vedic people, sharing so much of history yet very different. Indus Valley People were Dravidians or Aryans or someone else? As I had pointed out in one of my earlier blogs that the western Vedic scholars as well many Indian scholar have believed about the Aryan Invasion theory and the claim is that the people who wrote Rig Veda were Aryans and they came to India though Central Asia breaking into two different groups, one that remained in present day Iran and the other that invaded the peaceful civilization of Indus Valley though they were more advanced in terms of city planning and trade but lacked the warfare technology. And hence the original people who have been called Dravidian were forced to retract to southern India due to hostility they faced in the hands of Aryans. There is a tribe called Brahui that are found in north-western Pakistan and Afghanistan. Their language is similar to the Dravidian languages spoken in south, but is this tribe remnant of time when Dravidian was more widespread or it is a migration during 1000 AD or 13th or 14th Centuries. There are number of theories and each have support from their group. There has been significant effort by scholars to decipher the script that have been found in many seals excavated from various sites. The problem is majority of the script found have five characters that makes it very difficult derive some sense based on statistical analysis. There are two major scholars Asko Parpola and Iravatham Mahadevan both proponents of Indus script being a Dravidian one. Here is seal from Harappa and its deciphered meaning into the Dravidian language driven by a research conducted Tata Institute. With such interpretations it may be easy to conclude that Indus valley was Dravidian but this cannot be validated. Or if this was a gradual change and people spoke initially Dravidian, then bilingual and then Sanskrit/Prakrit which became a major language in north. Or is it similar to what is happening to us right now where English is kind of dominating all the local languages due to economic and historical consequences. I have not able to get to other side of story where it is claimed that Indus Valley people used Indo-Aryan or Munda subgroup or other Austroasiatic languages. I will try to get to that in my next writing. There is so much hidden in the ruins of Indus Valley Civilization and our ancestors have left a bunch of things that we are not able to figure out. Hopefully one day we will find the Rosetta Stone for Indus Valley Script and everyone of us will know what these seals and signs are hiding from us. And hopefully it politics will not be played and we will be enriched by their understanding of this world. I am just history enthusiast and do not have any formal training in History, Archaeology or Anthropology. So any mistake or omission is possible and will be corrected on notification.